A Christian painting which is thought to have been made by a Japanese Christians about 400 years ago was discovered near Tokyo. It was found at a memorial museum in Oiso Town in Kanagawa Prefecture. Experts who examined the painting said it was done with China ink on a hand scroll measuring 22 centimeters wide by 3 meters long and made of Japanese "washi" paper. The painting depicts 15 scenes relating to Jesus Christ and the Virgin Mary, including the Annunciation and the Pentecost. An analysis showed that the writing on the painting was Latin prayers that someone transcribed from a verbal form. The words "the year of 1592" appear at the end of the scroll. Experts say it is highly likely that the painting was made in that year, after their analysis. Christianity came to Japan 40 years before that year. The experts say they believe that Japanese Christians of the time reproduced Western religious paintings for use in their prayers. 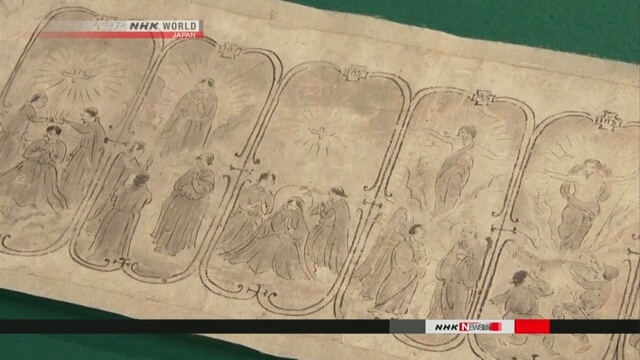 The experts say this is the first discovery of a religious painting done in the Japanese traditional style. The work is considered to be one of the oldest paintings made by a Japanese Christian. It is thought to be the first one to be found to include prayers. This is a significant discovery that tells about the religious faith of ordinary people at the time.